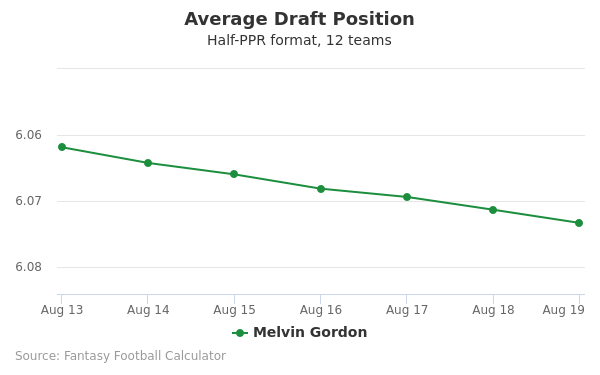 Melvin Gordon's fantasy value is measured by his average draft position (ADP) in fantasy football mock drafts. 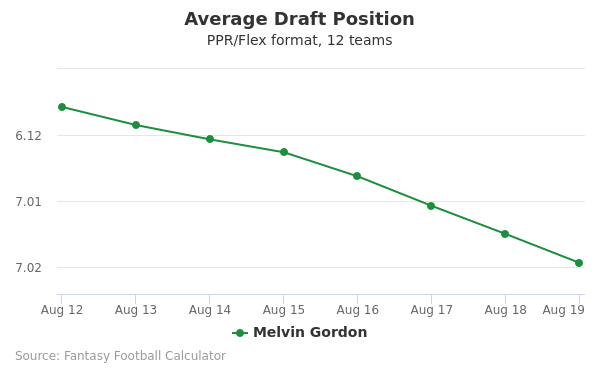 In recent drafts, Gordon's current ADP is 1.06, which indicates that his fantasy outlook is to be the 6th pick of the 1st round, and 5th selection overall. 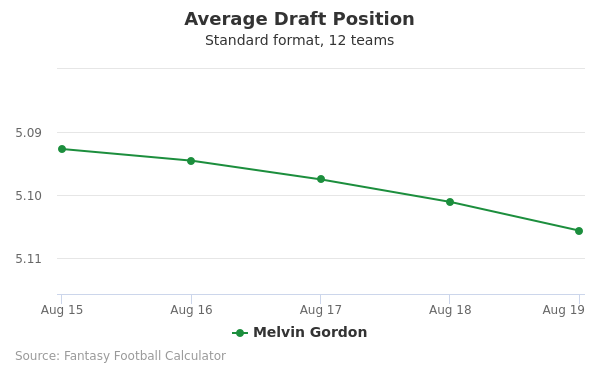 The code below will display a graph that updates every day to show the ADP data for Melvin Gordon for the past 30 days in 12-team PPR leagues. Draft LeVeon Bell or Melvin Gordon? Draft DeAndre Hopkins or Melvin Gordon? Draft James Conner or Melvin Gordon? Draft Davante Adams or Melvin Gordon? Draft David Johnson or Melvin Gordon? Draft Julio Jones or Melvin Gordon? Draft Melvin Gordon or Michael Thomas? Draft Joe Mixon or Melvin Gordon? Draft Melvin Gordon or Odell Beckham Jr? Draft Melvin Gordon or Tyreek Hill? Draft Dalvin Cook or Melvin Gordon? Draft Melvin Gordon or Travis Kelce? Draft JuJu Smith-Schuster or Melvin Gordon? Draft Antonio Brown or Melvin Gordon? Draft Melvin Gordon or Nick Chubb? Draft Melvin Gordon or Pat Mahomes? Draft Melvin Gordon or Mike Evans? Draft Marlon Mack or Melvin Gordon? Draft Melvin Gordon or Zach Ertz? Draft Damien Williams or Melvin Gordon? Draft Melvin Gordon or T.Y. Hilton? Draft Leonard Fournette or Melvin Gordon? Draft Adam Thielen or Melvin Gordon? Draft Melvin Gordon or Sony Michel? Draft A.J. Green or Melvin Gordon? Start LeVeon Bell or Melvin Gordon? Start DeAndre Hopkins or Melvin Gordon? Start James Conner or Melvin Gordon? Start Davante Adams or Melvin Gordon? Start David Johnson or Melvin Gordon? Start Julio Jones or Melvin Gordon? Start Melvin Gordon or Michael Thomas? Start Joe Mixon or Melvin Gordon? Start Melvin Gordon or Odell Beckham Jr? 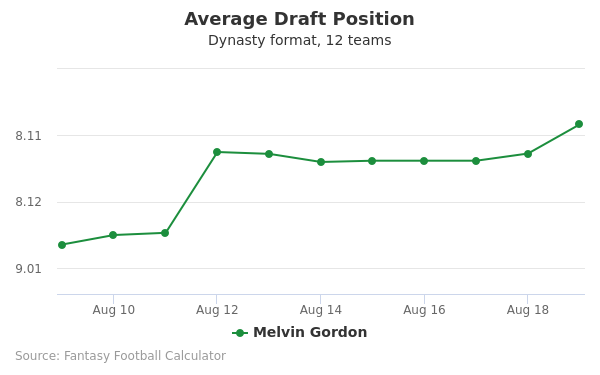 Start Melvin Gordon or Tyreek Hill? Start Dalvin Cook or Melvin Gordon? Start Melvin Gordon or Travis Kelce? Start JuJu Smith-Schuster or Melvin Gordon? Start Antonio Brown or Melvin Gordon? Start Melvin Gordon or Nick Chubb? Start Melvin Gordon or Pat Mahomes? Start Melvin Gordon or Mike Evans? Start Marlon Mack or Melvin Gordon? Start Melvin Gordon or Zach Ertz? Start Damien Williams or Melvin Gordon? Start Melvin Gordon or T.Y. Hilton? Start Leonard Fournette or Melvin Gordon? Start Adam Thielen or Melvin Gordon? Start Melvin Gordon or Sony Michel? Start A.J. Green or Melvin Gordon? Melvin Gordon III was born on November 6, 1993, in Kenosha, WI. He attended Kenosha Bradford High School from 2008-2011, participating in both football and track and field. As a track star, Gordon participated in the long jump for which he excelled. Gordon compiled four 1st place finishes in the long jump on his way to a third place finish at the WIAA Division 1 Sectional and a 2nd place finish in the WIAA Division 1, 2, and 3 State Championship. He also finished third at State in the 4X100 relay on a team with high school friend and future NFL draft pick Trae Waynes. Gordon rushed for 1,098 yards with 11 rushing TDs and 5 receiving TDs. This earned him a honorable mention for All-state and All-region by the Wisconsin Football Coaches Association (WFCA). Gordon rushed for 2,009 yards as a senior, and 38 touchdowns. He earned first team All-state honors by both the Associated Press and WFCA and was named the Wisconsin Gatorade Football Player of the Year in 2011. Gordon was recruited by Iowa, Louisville, Michigan, and Wisconsin as a tailback during his senior year. He initially committed to play for Iowa, then decommitted and chose to play for Big Ten rival Wisconsin Badgers. He joined a crowded backfield featuring Montee Ball (Denver Broncos, New England Patriots) and James White (New England Patriots). A groin injury limited his playing time as a freshman and resulted in his becoming a redshirt freshman. Gordon was a third string back as a sophomore behind Ball and White. He rushed for 621 yards and 3 TDs, including a season high 216 yards on 24 carries against the Nebraska Cornhuskers in the 2012 Big Ten Championship game. He also rushed for 51 yards against Stanford in the 2013 Rose Bowl game. Chosen as a Doak Walker Award semi-finalist during his junior year, Gordon entered his senior year as a Heisman Award hopeful and one of the top ranked running backs in college football. In a game against Nebraska on November 15, 2014, he set the FBS single game rushing record with 408 yards, with 4 TDs on 25 carries. Gordon rushed for the season 2,587 yards, which is second only to Oklahoma State Cowboys Barry Sanders, who set the FBS mark of 2,628 in 1988. Gordon was named one of three finalists for the Heisman Award, alongside Oregon QB Marcus Mariota, who would win the award, and Alabama WR Amari Cooper. Gordon finished second in the voting behind Mariota. In his final game, the 2015 Outback Bowl versus #19 Auburn Tigers, he rushed for 251 yards and 3 TDs, leading the Badgers to a 34-31 overtime victory and MVP honors. Gordon would win both the Doak Walker Award and Jim Brown Trophy as well as be named consensus All-American, 1st Team All-Big Ten, Big Ten Offensive Player and Running Back of the Year. Gordon declared for the NFL draft after his senior year at Wisconsin, projected a top ten pick by ESPN analyst Mel Kiper, Jr. Participating in the NFL combine in Carlsbad, Gordon set a record in the 60 yard shuttle at 11.0 seconds. He ran a 4.52 second 40 time and achieved a 35 inch vertical leap while participating at the combine. With the 15th pick in the 2015 draft, the San Diego (now Los Angeles) Chargers selected Gordon. He was offered a fully guaranteed contract salary of $10.66 million for 4 years, along with a signing bonus of $6 million and an option for a fifth year with the team. Gordon’s first NFL season resulted in his rushing for 641 yards with 0 TDs and a yards per game average of 3.5 and 1 rush of more than 60 yards. A knee injury after 14 games ended Gordon’s rookie season. The 2016 NFL season saw a resurgence of Gordon as the dominating runner he was at Wisconsin. In highlights from his sophomore NFL campaign, Gordon rushed for 997 yards and 10 touchdowns while also scoring twice on receiving TDs and gaining 411 yards. His resurgent performance in 2016 led to his being named to his first NFL Pro Bowl in 2017, as a replacement for Pittsburgh Steelers running back Le’Veon Bell. Season ending hip and knee injuries kept Gordon from going over the 1,000 yard mark in rushing for the season. Gordon, an only child, is close to his mother, Carmen, a former nurse. Gordon’s mother encouraged academic success as well as success on the field; he earned Big Ten All-Academic honors in 2012 and 2013. He wears the No. 25 as a tribute to his mother, who gave birth to him at that age. His handle on Twitter is @Melvingordon25.